Before he was a big game hunter, before he was a deep-sea fisherman, Ernest Hemingway was a craftsman who would rise very early in the morning and write. His best stories are masterpieces of the modern era, and his prose style is one of the most influential of the 20th century. Hemingway never wrote a treatise on the art of writing fiction. He did, however, leave behind a great many passages in letters, articles and books with opinions and advice on writing. Some of the best of those were assembled in 1984 by Larry W. Phillips into a book, Ernest Hemingway on Writing. We've selected seven of our favorite quotations from the book and placed them, along with our own commentary, on this page. We hope you will all--writers and readers alike--find them fascinating. 1: To get started, write one true sentence. Sometimes when I was starting a new story and I could not get it going, I would sit in front of the fire and squeeze the peel of the little oranges into the edge of the flame and watch the sputter of blue that they made. I would stand and look out over the roofs of Paris and think, "Do not worry. You have always written before and you will write now. All you have to do is write one true sentence. Write the truest sentence that you know." So finally I would write one true sentence, and then go on from there. It was easy then because there was always one true sentence that I knew or had seen or had heard someone say. If I started to write elaborately, or like someone introducing or presenting something, I found that I could cut that scrollwork or ornament out and throw it away and start with the first true simple declarative sentence I had written. 2: Always stop for the day while you still know what will happen next. The best way is always to stop when you are going good and when you know what will happen next. If you do that every day when you are writing a novel you will never be stuck. That is the most valuable thing I can tell you so try to remember it. 3: Never think about the story when you're not working. When I was writing, it was necessary for me to read after I had written. If you kept thinking about it, you would lose the thing you were writing before you could go on with it the next day. It was necessary to get exercise, to be tired in the body, and it was very good to make love with whom you loved. That was better than anything. But afterwards, when you were empty, it was necessary to read in order not to think or worry about your work until you could do it again. I had learned already never to empty the well of my writing, but always to stop when there was still something there in the deep part of the well, and let it refill at night from the springs that fed it. 4: When it's time to work again, always start by reading what you've written so far. The best way is to read it all every day from the start, correcting as you go along, then go on from where you stopped the day before. When it gets so long that you can't do this every day read back two or three chapters each day; then each week read it all from the start. That's how you make it all of one piece. 5: Don't describe an emotion--make it. When you start to write you get all the kick and the reader gets none. So you might as well use a typewriter because it is that much easier and you enjoy it that much more. After you learn to write your whole object is to convey everything, every sensation, sight, feeling, place and emotion to the reader. To do this you have to work over what you write. If you write with a pencil you get three different sights at it to see if the reader is getting what you want him to. First when you read it over; then when it is typed you get another chance to improve it, and again in the proof. Writing it first in pencil gives you one-third more chance to improve it. That is .333 which is a damned good average for a hitter. It also keeps it fluid longer so you can better it easier. It wasn't by accident that the Gettysburg address was so short. The laws of prose writing are as immutable as those of flight, of mathematics, of physics. For me, the most important advice is to not think about the story when one is not working on it. In the meanwhile the subconscious is doing the job for you. This simply works. Tip #8 – Be drunk. Tip #9 – Commit suicide once you’ve achieved fame and fortune. Thank you for sharing these writing tips. It always amazes me how one successful writer insists we must do one thing, then another believes we must do the opposite. I am not what I would call a successful writer yet, but it is pretty clear to me that the greatest obstacle to creating clear, understandable work, whether it be fiction or non-fiction, is actually showing up and writing. It is quite a lot easier to edit something that is written than it is to alter something that exists only in my mind. I do not remember the writer who said, “What separates a writer from a would-be writer is that the writer writes,” but I have read so many writers of different skill levels I would have to agree. Anyway I really appreciate this article and the time you put into sharing it with us. I will be locating the book cited and learning more from Mr. Hemingway because of your efforts. Thanks for curating this classic list. It’s sometimes easy to dismiss the iconic writers, but Hemingway was a pioneer in his time — and predated the abundance of writing advice and MFA programs we live in now. It’s sometimes easy to iconic writers. I did find them fascinating. Number two really resonated with me as something I need to start doing today. Usually, I exhaust my imagination and then allow it to refuel for the night, but I can see how stopping before it becomes exhausted will help me to never be stuck the next day. Great information. I never heard of #2 and #3 – interesting. I’ve shared this also. Thanks for sharing, these tips will not just help to write fiction but can also help for writing blog post, books or on topic which you less aware. Outstanding Article!!! Sound advice. It made me feel as if “Papa” had sent me a personal letter. Thank you! Seven Times Thank you! This is such a great resource, Thanks for sharing! These are very good pointers from a master writer. Thank you. Excellent article and so helpful to me right now. I have worked with the subconscious for some time now in other areas and to hear a writer listen to his in this intuitive way fills me with so much joy. Thank you for your hard work, greatly appreciated. I don’t write, I bleed. Like Hemingway… no one else! (I believe) Thanks for the tips. Some days you’re going to wake up tired of writing your book (or MS, or whatever it is). Other days you’re going to wake up tired of the whole idea of writing itself. Have a plan for those days. Get away from it. Go somewhere. Do something different. Kick back. Rake the lawn. OR: do the ‘grunt work’ on those days (like looking stuff up, verifying facts, etc)–the stuff you know you’re going to have to do someday anyway. Don’t even attempt to do the actual “writing” on those days. Use them to do the ‘house-keeping’ work; the ‘non-fun’ stuff. Also: what’s worked well for me lately: write stuff out of order. (We have computers to move it into the right order later). Do this and it tends to stay fresh within itself. Start at “A” and continue in a long straight line and it can sometimes get stale and trail off into kind of parody of itself. This has really helped me lately. Write the different pieces out of order. i have all ways thought that an author should have at lest a hands on knowledge of what he is writing . i guess it , at lest for me gives them an honest credibility. for example , a book on child rearing written by a non breeder . or a book on boxing by an author that’s never been in a fight.thanks for your time . After reading this I tried writing away from the computer and I have to say it actually helped. Just something about writing with my hand instead of typing brought a deeper concentration to what I was doing. I tried creating emotions instead of just telling them in my writing. I don’t think it came out perfect but its definitely better than what I had before. He has some great incites on writing. Glad I read this. Great post. Fine advice on writing, using one’s imagination is always challenging and mysterious. Sometimes a cup of coffee spurs us on. Other times we need to distance ourselves from the material for a spell to be able to see what part of our project has real value and worth. Writers block can hit us in some intensity at anytime. yet if the words always flowed like a waterfall with no effort at all would we view them as an accomplishment? No. We always have to challenge ourselves to see how far we can grow, learn and strive for excellence. Thanks for the great writing tips. Here’s a cool free writing source. Fantastic insights. Thank you, i will practice some of these suggestions. Tip #3 is useful in other applications as well. As an undergraduate philosophy student, I had one particularly difficult course with long essay exams. I would study endlessly and still do poorly until I learned to stop studying one full day before the exam and simply play – go hiking, watch a movie, be with friends. Whatever it was, I was not thinking about the material for the course. I walked the half mile to class thinking only about the walk itself. Once I learned this, my essays were clear, concise, and netted me an A on all the remaining essays for the course. Tip nr. 8: forget my tips and WRITE! Wonderful share of this great job. Thanks for such much information. Very practical and helpful. I came across some of these reading ‘A Moveable Feast’, but not all of them and not arranged in this way. Thank you. I’m mentioning your post too and sharing. I read it on DM’s wall. I really enojoyed it, thanks! Interesting tips and methods to keep writing. Not forgetting Hemmingway’s style, some of these ideas are for straight novelists and not good advice for the modern hack who wants to write super-best-sellers! Great post. Nice suggestions on writing, using one’s imagination is always challenging and hard to overcome. Sometimes a cup of coffee/tea spurs us on. Other times we need to distance ourselves from the material for a spell to be able to see what part of our project has real value and worth. Writers block can hit us in some intensity at anytime. yet if the words always flowed like a waterfall with no effort at all would we view them as an accomplishment? No. We always have to challenge ourselves/everyone around us to see how far we can grow, learn and strive for excellence. Thanks for the great writing tips. Here’s a cool free writing source. Great post, I agree with the part about writing in pencil. I did this with my first draft as well and I really enjoyed typing it into to my computer afterwards. It gave me a chance to look at my first rough draft as a whole and make changes as I went. As an author myself, it’s always nice to come across expert advice… you can always learn something new. I prefer using a pen to a pencil. Feels more flowing. It’s always been my habit to write first draft by hand. What would be the benefits of using a pencil over a pen? I am sure most of the old-time writers used pens. Anyway…yes, great tips, thanks Papa H! I really enjoy reading them every day. I’ve learned a lot from them. thanks for putting an effort to publish this information. Gurdjieff nailed it. ‘A Moveable Feast’ was by my side while I was writing my second novel. It could not be there when I was writing my first because I was in prison. For me ‘A Moveable Feast’ is my synonym for JOY. Did Hemingway come up with that title? Brilliant! WOW!! Great masterful suggestions from a great MASTER!! Hemingway was writing 80 or 90 years ago and maybe the pens weren’t as efficient as today. Pencil can always be erased if you make a mess whereas a few corrections with ballpoint are yuck. I’ve written songs and poems as well as 30 years daily journalism and pencil works very well in songs/music – just erase Dmaj and put in C.
Hemingway would inspire me to write a novel. That idea of leaving something for the next day is exactly how film-makers work with TV dramas etc – leave something about to happen. Very helpful to anyone wanting to write with honesty and clarity. Overabundance is more like it. Today I wrote a complete sentence. Thank you for this! I am so glad I came across such a piece. Reblogging! Hemingway’s “short, declarative sentences,” are poorly constructed to a truly remarkable degree. They have an amateurish sound to them that is so prominent, I am astonished more people (especially literary critics) have not pointed this out. I know that Hemingway is often considered “The Greatest Writer Who Ever Lived” by many people, and his prose frequently receives an inordinate amount of praise. I cannot understand this. 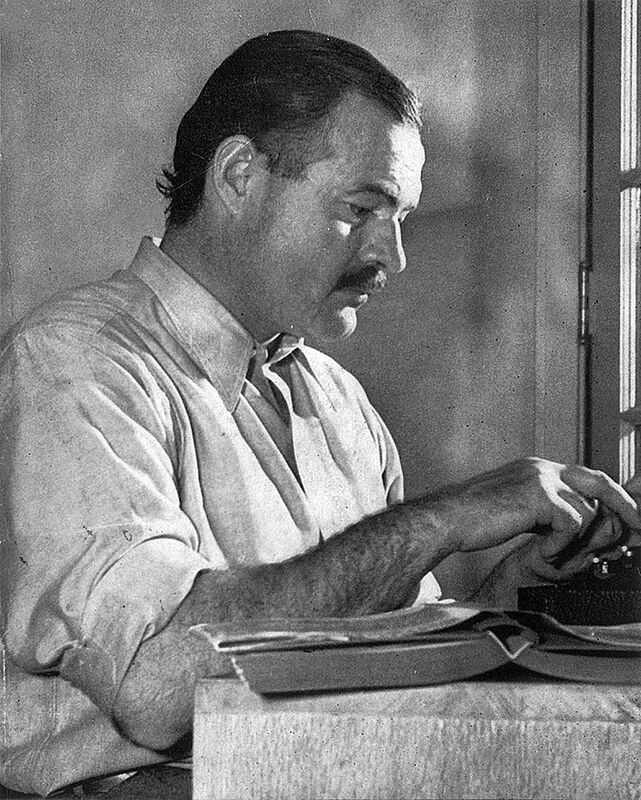 Professional editors routinely REJECT stories that are written like Hemingway’s, often simply BECAUSE of the writing. It is literally the worst prose of any supposedly “great” writer in all of English literature. Besides being astoundingly boring, there are so many things wrong with this passage (like most of Hemingway’s prose in general) that it’s hard to know where to begin. First of all, it reads very oddly. It feels like someone has awkwardly spliced together several different sentences to make even SHORTER sentences. It feels stilted. It feels like someone has gone in with scissors and snipped out certain words that probably should be there (a common Hemingway habit), making it sound jarring and disjointed. (Hemingway didn’t like “big words,” whatever THOSE ultimately are.) Amateur writers (and bad writers) often try to force their writing to sound a certain way (which we know that Hemingway did, since he wrote about this constantly), to give themselves a prose voice of depth and profundity that they don’t naturally have, and it shows. Such efforts frequently sound stilted, awkward, and unnatural, just like the above passage. It’s easy to tell when a writer is deliberately interfering with the natural process of smoothly putting words on a page, and seasoned professionals don’t do this. And unfortunately, pretty much all of Hemingway’s writing sounds rather like the above quote. Hemingway had an awful lot to say about how to craft one’s own style of writing (which, according to author Stephen King, is quite impossible). Hemingway had all kinds of grand literary theories and principles about how he thought writing SHOULD be, and it’s often much more interesting to read what Hemingway wrote about HOW to write, rather than to read his actual books – another sure sign of a bad (or amateur) writer. Hemingway came up with a lot of these ideas when he was a young and inexperienced writer, and he unfortunately stuck with most of them his entire life. The most notorious of them is his “Iceberg Theory of Writing,” the idea that 80-90 percent of your story should exist “below the surface” (unwritten.) It sounds great on paper, but in practice, unless the 10 percent of the story that you actually DO write is very, very interesting, you probably won’t end up with much of a good story. I know writers who struggle to write down even just 60 to 70 percent of the story they want to tell, and even then, it can be difficult to keep a story interesting. 10 percent is slim pickings indeed. This likely helps explain why Hemingway’s stories are often so dramatically dull, and don’t translate well to film; not much happens in them. They’re not very interesting. Unlike the stories of J.R.R. Tolkien, whose stories make astonishing dramatic movies, and whom I consider to be a vastly superior writer to Hemingway. So in summary, with his forced, unnatural writing, awkward and cramped short sentences, and dull, undramatic stories, why is Hemingway so famous? I think it’s just an accident, really. I think he just happened to be in the right place at the right time, and for no other reason. Editors frequently say that there are absolutely no rules in the publishing business, about why one writer becomes famous, and another does not. If it happens, then it happens. I think Hemingway is just an overall bad writer who got very, very lucky – and I think he has been unfairly held up for years before the rest of us as what a writer SHOULD be, despite his rather boring stories, badly-written prose, and unnaturally cramped-sounding short sentences. Hello Guys I Really Like This a Lot. I Must Thankful to you for Sharing this Important Information. Hemingway was writing 70 or 80 years ago and maybe the pens weren’t as efficient as today. Interesting. Well before I saw these posts, I was getting a novel together by writing independent blocks completely separately. Of course, I know how the parts tie together, but I am writing them as ideas come. This way, I never have a writers “block”. It was my favorite American poet William Carlos Williams who said of writing something to the effect of …. “…99% of what you will write isn’t worth the paper its written on, but %100 is worth less unless you put the pencil to the paper.